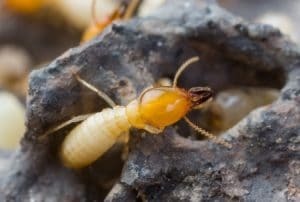 Termites are often called the “silent destroyer” because they may be secretly hiding and thriving in your basement or yard without any immediate signs of damage. While each termite species thrives in different climates and eats different types of food, all termites require four things to survive — food, moisture, shelter and optimal temperature. Unfortunately, all homes, regardless of their construction type, can provide these ideal conditions for termite infestation. Termites are detrivores, or detritus feeders. They feed on dead plants and trees as well as dead parts of living trees, including wood and wood in the soil. A termite’s mouth is capable of tearing large pieces of food. This ability is what causes concern in human dwellings: while termites only measure approximately one centimeter in length, their feeding habits are capable of causing costly damage to property. House foundations, furniture, shelves, books, carpets and insulation are all possible feeding sites for termites. Subterranean termite homes are usually formed in soil. Within these mounds, termites build elaborate tunnel systems and mud tunnels through which they access aboveground food sources. Drywood termites live within the wood they consume and oftentimesinfest walls and furniture. Since termites are a constant threat to your home, here are some things you can do during the year to help maintain the effectiveness of A-One Exterminators termite treatment plan. Small steps make a big difference in termite prevention and sustaining an effective termite treatment plan. Start by eliminating moisture conditions and food around your home. These simple steps make your home a less attractive target, helping deter termites.